Fine pigment suspended in a binder, which can be thinned with water. 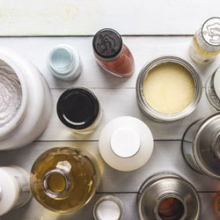 It dries quickly and is easy to apply using various techniques. Works can be gentle, washy and light, or bold, full of colour and with definite lines. As well as a wide selection of brushes and colours we have several excellent books about watercolour. Also known as aquarelle, the beauty of traditional watercolour lies in its transparency. When a loaded mop brush glides colour across the surface of the finest watercolour paper, the gum arabic binder helps to maximise the vibrancy of the pure pigment. 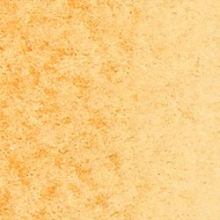 Some paints benefit from the improved flow and vibrancy that a little honey can bring to a watercolour paint formula. 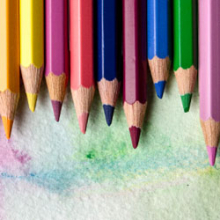 The spaces between the colour allow the white of the paper to add luminosity to the end result. 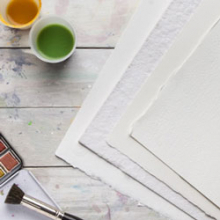 Many beginner painters start with watercolour, but they’re also loved by some of the most successful professional painters. 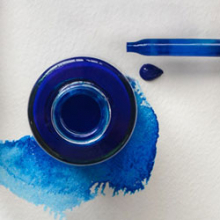 The best watercolour paints offer unsurpassed lightfastness and enviable colour brilliance. 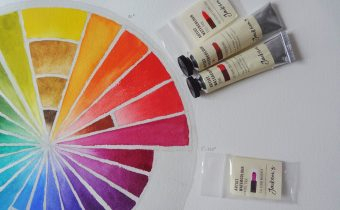 Our watercolour department offers the very best watercolour paint supplies available. 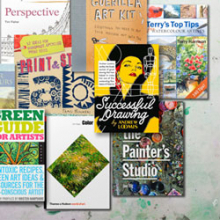 Browse brands including Daniel Smith, Jackson’s, Daler Rowney, Winsor and Newton, Schmincke and Rembrandt. 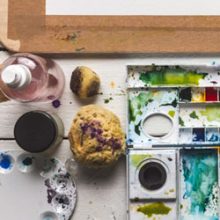 You’ll find everything you need to get started in watercolour at Jackson’s. 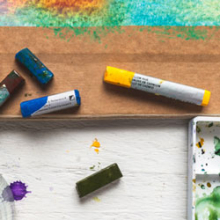 Watercolour paint sets can provide great value. 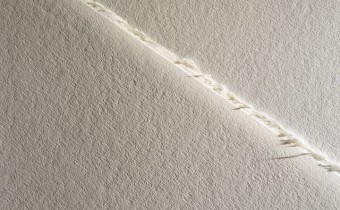 Acid free papers made from wood cellulose - or the finest 100% cotton and linen papers - are available from St. Cuthbert’s Mill (home of Bockingford and Saunders Waterford), Arches, Fabriano and many more. Whether you’re an outdoor watercolour painter or enjoy painting at the kitchen table, we have every kind of easel to suit every possible need. Tilting watercolour easels allow you to work both horizontally and vertically. 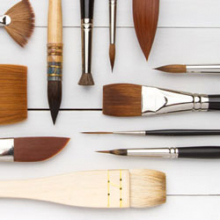 Traditionally sable brushes are the water colourists choice, with maximum liquid holding capacity. 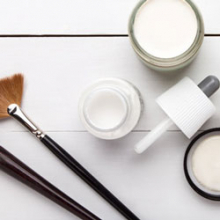 However synthetic brushes offer an excellent alternative, capable of showing your watery washes and vibrant marks at their best. 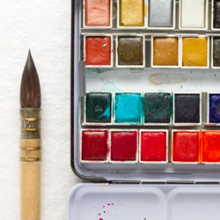 How will you approach your watercolour? Botanical watercolour painters often ask us for the smoothest hot pressed cotton paper, and tiny brushes to achieve the finest detail. 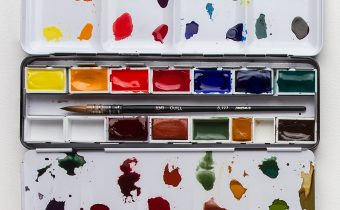 Dynamic contemporary watercolour painters often take risks, adding watercolour mediums to control the behaviour of the paint, adding effects and textures. Masking fluid resists paint and can help you keep light areas in your painting without fear of watercolour flowing where it shouldn’t. 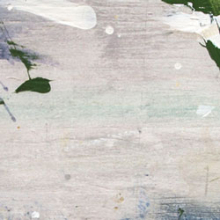 Opacity can be added with chinese white, or combining gouache and watercolour. 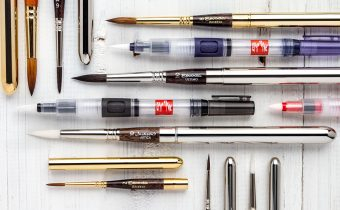 The crisp lines of a lightfast, permanent drawing pen contrast beautifully with watercolour in pen and wash techniques.